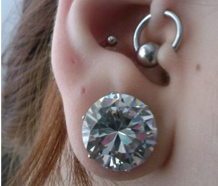 Make sure you keep your piercings hidden at school with our fantastic range of discreet body jewellery. Wear our fantastic back to school jewellery in both your large and small stretchings. Comfortable and easy to wear, our silicone jewellery will fit perfectly and stop you from standing out and getting in trouble at school. Everyone will want some flesh tone body jewellery this year! Get yourself one of these flesh coloured solid silicone hider plugs ideal for wearing to school. These comfortable and safe plugs will hide your stretching and will feel smooth against your skin. Made from soft biocompatible silicone, these metal-free plugs are safe to wear to hospital visits, school and work. 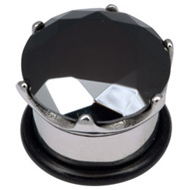 The flat discs either side of the plug will keep this secure and in place as well as protect this body jewellery piece from catching. Everyone will be impressed with this great value flesh tone hider plug and will want one to make their stretching look more discrete. Wear this beautifully designed clear silicone flesh tunnel which will feel comfortable everywhere you go and especially when you are asleep. 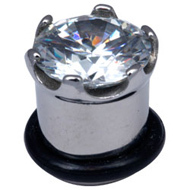 The clear design will disguise the fact you have a tunnel and the squishy material will allow you to fit this body jewellery piece in your stretching easily. This skin-friendly silicone tunnel will feel soft against your skin and will stop irritation. Easy to clean and remove, this clear flesh tunnel will look discreet and will stop you from getting into trouble with your teachers. Great value for money and stylish, this kaos silicone flesh tunnel will work a treat! This entry was posted in Ear Piercings, Hiding Your Piercings, Stretched Piercings, Stretching Jewellery and tagged Ear Plugs, Ear Tunnels, Fake Ear Plug, Fake Ear Plugs, Fake Ear Tunnels, fake flesh plug, Fake Flesh Plugs, Fake Flesh Tunnel, Fake Flesh Tunnels, Fake Piercing Tunnel, Fake Stretching Tunnels, Fake Tunnels, Flesh Plug, flesh plugs, Flesh Tunnel, Flesh Tunnels, hiding piercings, kaos hider plug, kaos tunnels, Piercing Plugs, silicon flesh plugs, silicon flesh tunnels, silicone flesh plugs, silicone flesh tunnels, silicone hider plug, silicone tunnels, Stretched Plugs, Stretching Tunnels on August 25, 2011 by Piercing Guru. We all know how frustrating it is when your school objects to your stretchings but if they claim that your tunnels are not safe, you may be able to keep your stretchings by wearing silicone hider plugs. Some schools believe that flesh tunnels and plugs are not safe during sports and cite this as a reason that you have to remove your plugs. In a way you can see what they mean â€“ although I think being injured because by your flesh tunnels is extremely unlikely! If you are playing contact sports like rugby or you were struck on the ear, your flesh plug would concentrate the impact on your jawbone/behind the ear. This could technically lead make the impact more serious or lead to injury. The chance of this happening is very small but schools are obliged to take all risks into account and may be afraid of angry parents who could blame the school for allowing you to wear flesh tunnels while playing sports. This might all sound rather unlikely but some schools do claim that stretching jewelled is dangerous. Thankfully you can eliminate this â€˜riskâ€™ by wearing silicone hider plugs. 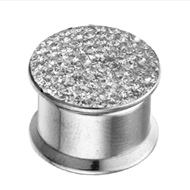 If your school wants you to remove your jewellery on safety grounds I recommend researching silicone hider plugs and presenting your school with evidence that they are safe to wear. Hopefully they will allow you to keep your stretchings on the condition that you wear safe, discrete jewellery at school. This entry was posted in Ear Piercings, Hiding Your Piercings, Silicone Body Jewellery, Stretched Piercings, Stretching Jewellery and tagged hiding piercings, kaos silicone, silicone flesh plugs, silicone hider, silicone hider plug on August 30, 2010 by Piercing Guru. Discover a new level of comfort with Kaos Softwear silicone body jewellery. Kaos Softwear make a range of funky silicone flesh plugs, eyelets and flesh tunnels that are unlike anything else – they are soft and squishy instead of hard like regular tunnels. Because they are so soft, Kaos Softwear tunnels can be folded for easy insertion and they are painless to put in. They are great for sleeping or wearing headgear because instead of pushing into your head they simply squash down. For me this is the main benefit of Kaos tunnels â€“ I like to wear big headphones with my iPod but when I do this with regular tunnels it gives me a headache. No such problem with the Kaos tunnels â€“ I wouldnâ€™t even know that Iâ€™m wearing them. The same rule applies if youâ€™re wearing a skate helmet, cycle helmet or if you have to wear protective headgear at work. In my experience Kaos silicone plugs are also a good compromise at work or school. Some employers and schools think that metal stretching jewellery is unsafe or unsightly, but soft, light Kaos tunnels are often more acceptable to them. Kaos also do a Silicone Hider Flesh Plug (see below) that will is ideal for school, work and family gatherings. This entry was posted in Ear Piercings, Hiding Your Piercings, Silicone Body Jewellery, Stretched Piercings, Stretching Jewellery and tagged Body Jewellery, kaos, kaos hider plug, kaos softwear, silicone flesh plugs, silicone flesh tunnels, silicone hider plug, silicone stretching jewellery on April 10, 2010 by Piercing Guru.